There is no shortage of good mice on the market at the moment. What we have is a plethora of almost perfectly accurate input devices adding and subtracting features to try to achieve the perfect balance of price, quality and accuracy. One of the most reliable names on the market is Logitech, having produced mice for a great many years, they know what they’re doing. Enter the Logitech M330 Silent Plus. A budget/travel mouse that promises both high accuracy and the complete lack of “click.” The second of those features will be particularly enticing for anyone who travels or perhaps uses a laptop in bed with a partner sleeping beside them. The mouse itself is almost all plastic, making it light and easy to pack. There is a layer of rubber to add durability, comfort and, most importantly, grip. Between the two buttons is a scroll wheel, with a push button function and sharing in its surrounding buttons ability to be almost silent. Behind this, jsut about the Logitech branding is a little LED indicator. On the bottom are two plastic pads, smooth to the touch and designed to glide across any flat surface. The mouse runs off one AA battery. Logitech have informed us this battery should last 18 months. Having had the mouse for one month I cannot comment on what the full range of the battery life is, however, I have lost one-third of the battery thus far and I’m not using the mouse as my daily driver. Instead, it’s paired with a laptop and only used for a few hours, two to three times a week. However, anyone coming to this mouse is not coming for battery life or perhaps comfort, these are secondary bonuses. Instead they’re coming for the lack of noise. It’s almost surreal, it feels like there’s something missing when you click a button or roll the scroll wheel. 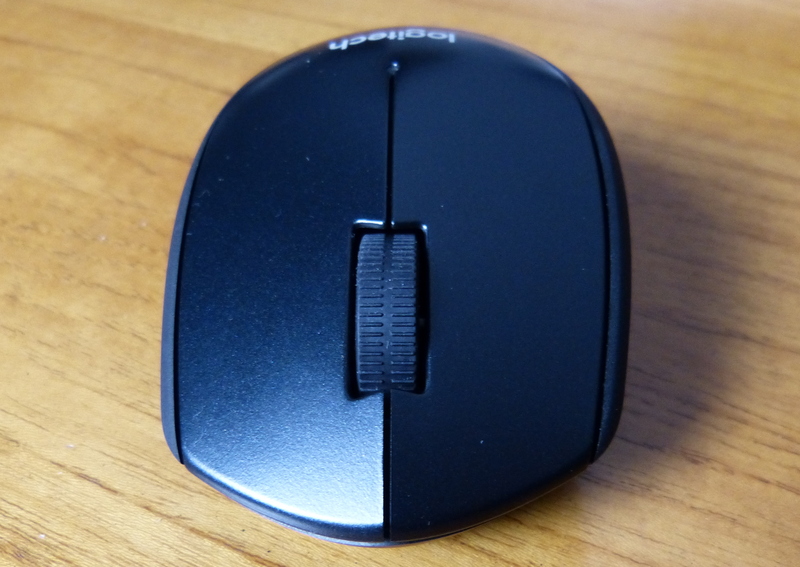 There is the smallest, lightest thump a two bits of rubber inside the mouse collide and the scroll wheel has a tiny, plastic click emitting from it and is virtually silent when used for scrolling. You will not be disturbing anyone with this much, the Silent aspect is beautifully realised. As for accuracy, it’s difficult to measure on a common consumer computer, however, I did have a go. Facing off against a Logitech MX master, the M330 came in with a faster lag time, by 10ms. Whilst the M330 is a great deal lighter than the MX Master, it does appear to be highly accurate. Where the M330 could be improved are the features. With only 3 buttons in operation, I only wish that there was a simple back button above the thumb grip two concrete this is one of the best mice on the market. Some will disagree the back button is not necessary, however, it would be better to have the option even if there were to add another couple of pounds on the price tag. All in, the Logitech M330 Silent Plus is an almost perfect travel match. Robust enough to survive a few days at the bottom of your back. The battery is easily replaceable in the event you do run out of charge. Using it on a plane will not upset the person beside you. It’s comfortable enough that periods of use will not result in a sore wrist. And as the name suggests, Silent. You can grab the Logitech Silent Plus For £29.99 here.